The shoe-billed stork or more simply, the shoebill, does not need particular references for being remembered by the ornithologists or by the lovers in this matter. As soon as this name is pronounced, immediately the eyes of those knowing it or having heard of it light up of curiosity and of wonder due to the morphological particularities of this bird and even more for the rarity that until a few decades ago placed it as an invisible and little traceable being or perhaps also as a disappearing species. Already the first explorers of the East Africa lands, had met this strange bird and had the occasion to recall it in their reports, especially as the territories where it lives were the epicentre of lots of missions of nineteenth-century explorers looking for the sources of the Nile River or of the Mountains of the Moon, rightly places where lives this very strange kind of bird. Also the books of ornithology of the previous centuries were talking of it and did reproduce its features with precision, seen that the identification at the time was a very easy thing: a gunshot to the specimen met and immediately they had the way to figure out what it was. Figuier made a very nice description in his book The Birds of the second half of the ‘800 with a so precise and detailed engraving as to seem a present work. It called it whalehead stork and scientifically assigned it to the genus Baleniceps instead of Balaeniceps committing one of the usual Latin mispellings so much common in that century. 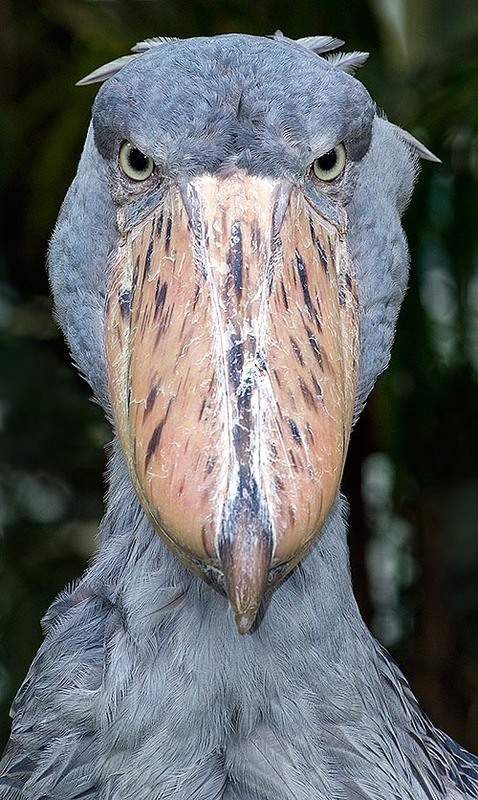 The Shoebill (Balaeniceps rex Gould, 1850) belongs to the order of the Pelecaniformes and to the family of the Balaenicipitidae and is the only extant species belonging to this family and to its genus. From its discovery to the present, this so strange and particular bird, has been subject of studies and classifications that have initially deemed it as belonging to the group of the storks, then to the pelicans, then again to the storks and finally with the last studies through the researches on the DNA, has been finally allocated to the Pelecaniformes approaching it as features to the Common Umbrette or Hammerhead stork (Scopus umbretta) also living in the African continent. Gould himself when he saw in the middle of the XIX century the first specimen in the collection of a Nottingham gentleman who had taken it in Sudan on the banks of the Upper Nile and on which did the scientific classification, was so strongly impressed and so much astonished to say that that being “was the most extraordinary bird he had ever seen since many years”. Statement that moved the curiosity of all the scientists of the time for many years and that originated recognition missions looking for this bird. Initially considered as quite rare, it was instead understood that its scarity was due by the incredible discretion this bird keeps during its life besides the environment where it lives that renders it invisible and poorly approachable. As we shall see, it lives in inacessible locations, uncomfortable, out of reach and crossable only after an exhausting zigzagging among reed beds and immense flooded lands of high papyruses that practically obscure the vision even a few metres far away. All information and the scientific references of this bird refer to its huge and strange bill. The scientific name of the genus Balaeniceps comes from the melting of two Latin terms, “balaena” = whale and “ceps” = head, whilst, always from Latin, the species rex means king. It is not exactly known why it has deserved this last epithet, maybe due to the slight ruffle of the feathers on the nape that creates the impression of a fake crown or due to the massive size of its structure that renders it the most powerful being in its territory, the king of the swamp, giving new credit to the impression gotten by Gould himself when started its first studies. The massive bill is always recalled also in the common names of various countries: in English, Shoebill or Whale-headed stork; in French, Bec en sabot or Baléniceps roi; in Spanish, Picozapato, in German Schuhschnabel and finally, in Italian, Cicogna dal becco a scarpa, or, simply, Becco a scarpa. Interesting is also the nickname given by the Arabic countries, Abu Markub, that is, father of the shoe, or in Portuguese, Cegonha-bico-de-sapato. Few decades ago, it was thought that this bird was confined only in the inextricable swamps of the White Nile, a marshy area of several tens of thousands of square kilometers, almost uninhabited and where it was almost impossible to enter and even less to know from the local populations what was inside them. In the following years more accurate researches and deeper explorations have instead revealed that its presence was vaster and well distributed and was spreading to even areas far from the territories where it was presumed to be confined. Anyway, this bird is the African subject most coveted by the scientific researchers and its research is so constant and persistent that they have come to discover its presence in areas deemed little suitable for this bird or of ambients not sufficiently vast to host it and to grant the privacy it needs. This just as support of how it is reserved and poorly observable in nature. 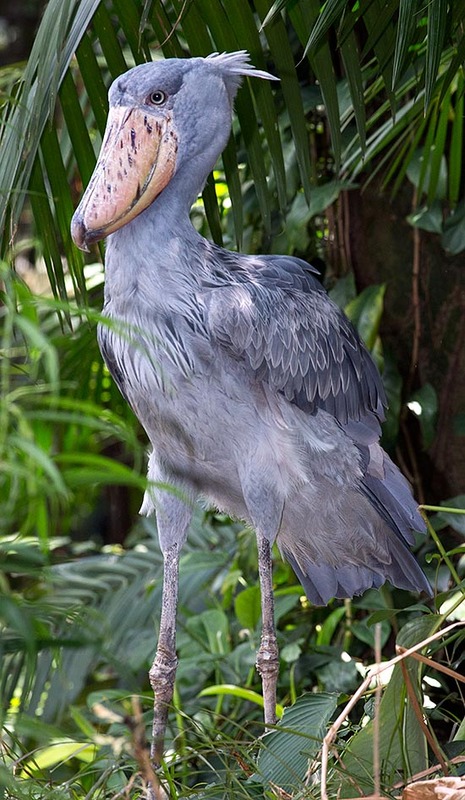 The shoebill lives in all the upper basin of the Nile River and of its numerous tributaries, besides in other water bodies of the Rift Valley in the Albertine Rift, the westernmost and south up to Zambia, including in this range South Sudan, Ethiopia, Uganda, Centrafrican Republic, Rwanda, Congo DR, Tanzania and Zambia. A continuous range forming a belt with direction north-south equally split by the equatorial line. Some strongholds are well populated whilst others are occupied by an exiguous number of specimens but that, however, does not put a risk the survival of this bird. It is hoped that the continuous researches may lead to discoveries of new habitats even distant and detached from the original area. It is a sedentary bird and usually spends all its life in the same area where it was born. The shoebill is an exclusive inhabitant to vast impenetrable reedbeds, flooded with still water, often putrescent and little oxygenated. Locations where it is almost impossible to enter due to the compactness of the vegetation, the muddy and saggy soil and due to the dangerousness given by the presence of reptilians and dangers of all kinds. The vegetation is so much thick that also this bird would not be able to walk and move if not following the traces left by the passage of hippos, elephants and crocodiles. 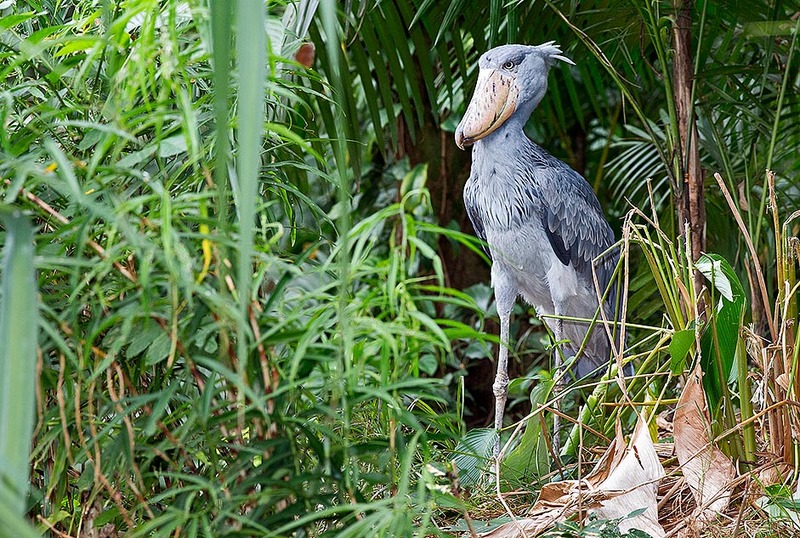 The shoebill does not love too much flying though being endowed of a strong alar apparatus but prefers to walk floating on the layer of papyruses or semi-submerged reeds while looking for its big preys. It usually looks for those small open spaces hidden inside the reeds or, when the water is subject to slight flows, those very small rivulets semi-covered and little deep where the movement of the water facilitates the formation of a passage. It is rarely discovered in open places and when this happens, it keeps absolutely still even in close proximity until when the danger has gone or, when the escape distance exceeds the safety limit, here it is taking the flight and, moving lightly over the top of the reeds again swooping inside this dense wilderness. 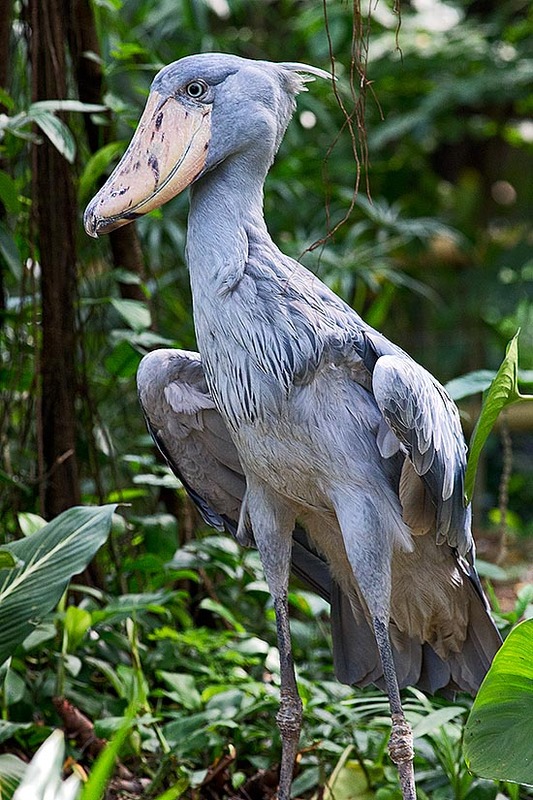 The shoebill even if elegant on its long legs, is a very robust bird with considerable measures and with a body structure massive and squat in its entirety. It is an archaic bird, with a pre-historic look, abnormal in the shapes and the details and also the behaviours themselves confirm this particularity. It would suffice to observe it with the nictitating membranes closed to understand how much strange is this bird and how it differs from its similars. The nictitating membrane is particularly thick and matt, greyish and seen in the particulars similar to those of the big reptilians. We have already mentioned the robust bill but knowing better its dimensions, we can imagine what strength it may produce and what capacities it may contain. The bill is so much robust to result disproportionate to the head of this bird and, with a little imagination consequent its name, so big to be possibly worn by a normal human foot. The bill itself measures more than 20 cm of length and 10 cm of breadth and equally in height seen that it results structurally squared and slightly saddle-like in the upper part. The tip is armed with a deadly hooked and sharp crook, a real weapon for tearing and separating the prey or for striking one of its terrible deadly blows. The victims are usually rather big, a times in an unthinkable way but are swallowed whole and only rarely, or when intended for the chicks, may be reduced in big pieces. The strength of this bill is most remarkable and at times the only pressure done by the mandibles on the sharp margins is sufficient to annihilate the prey. It is also very capacious so much to be possibly used as a container for carrying water to the nestlings to cool them up from the burning rays of the sun. It can contain even almost one litre of water. 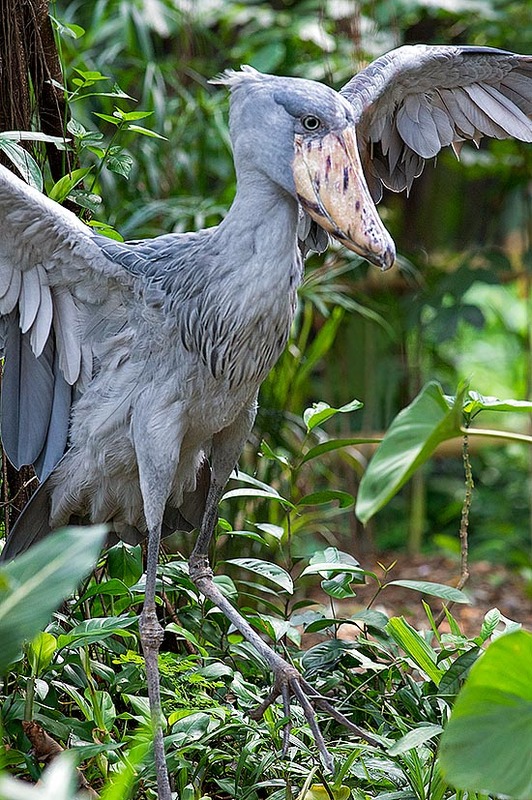 The shoebill can be more than 120 cm long with a total height of almost 150 cm. Its weight reaches the 7 kg thus explaining its massive structure and a wingspan of about 250 cm. The wings, besides being long, are very ample therefore suitable not only for flying but also for twirling, operation done rarely but when so, performed with great skill. The neck is massive, short, enclosed between the shoulders and hugely large, entirely different from that, usually slender and elegant, we see in the waders. Also the head results disproportionate to the body seen that it must support and contain that strong musculature that counterweights such an enormous bill. The legs are long and very robust, even them outsized and the feet are equipped with very long fingers to give the possibility to such a heavy bird to walk on the floarting shrubs without sinking totally. Actually, the second finger may reach the exceptional length of almost twenty centimeters. It is therefore a bird that during its millennial evolutionary convergence has collected in its own morphological characteristics, peculiarities of other animals taking advantage from those benefits that have later on led it to become the “rex” of the swamps. Butcher’s bill, wrestler’s neck, carnivore’s head, strong walker’s legs and paludicolous bird’s long fingers. 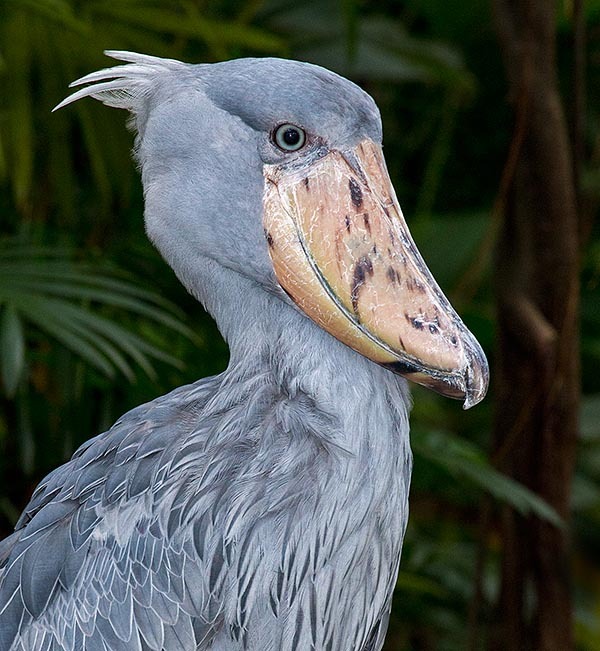 The livery of the shoebill is bluish grey on the whole upper part of the body with slightly whitish abdomen and throat. The bill is flesh coloured tending greyish whilst the legs are also ash grey. The eyes are yellowish, rounded and rather big, suitable for hunting even when the light does not abound. There is no sexual dimorphism but in the size, larger in the male, whilst the young are of a colour tending to be more brown with a livery that they maintain for some time. The feeding of this bird is quite varied also if it concerns mainly big fishes living in these swampy waters. It seems that the conditions of little oxygenated water oblige the ichthyic fauna to take breaths of air in the surface, thus indicating the presence to this big predator. This situation is indicated as determinant cause for its presence. Just to confirm its archaism, one of the preferred preys is also a primordial being as if the pairing should exist since their early days on this planet. As a matter of fact, the Lungfish (Protopterus sp.) is the main part of its alimentation. It nourishes also of grass snakes, lizards and other reptilians, crocodiles included, but also of nestlings, mice and small mammals that it crushes in its very strong jaws. The Balaeniceps rex is an exasperatingly solitary bird, so much that during the period of coupling the female and the male use different ranges for their feeding and hunting. It nidifies deep in the reeds in small openings where the vegetation has been flattened in order to have available a space where to place its nest. This one is formed by a mass of rushes or aquatic grasses usually leaning on the muddy bottom even if it might easily float on the surface of the water. In any case, the moment chosen for the nidification coincides with the maximum level of the water and goes on till the dry season and consequently the mass consolidates on the soil as the level decreases. Usually are laid three eggs that are brooded for 30 days and the chicks keep in the nest or near it for 10-12 weeks more. In periods of food shortage and at times without any particular reason are observed cases of cainism after which only one chick survives. The young do not reach the sexual maturity till the third/fourth year during which they live in the same area with the parents. The shoebills have a life expectancy exceeding the 30 years when captive but it is thought that also in the wild, once passed the first years, most delicate for them, they may reach such age. As we have seen, this bird is sufficiently diffused in vast areas but always in reduced and isolated number; it does not have many foes in their natural world but crocodiles or carnivores frequenting this environment but is recently subject to indiscriminate catches and also to removal of eggs and nestlings for private breedings and therefore it is considered as a vulnerable species and subject to particular protection. The fear for its survival stands in the modifications of its natural environment or in its disappearance besides an increasingly strong demographic pressure. Plenty of zoos and naturalistic gardens hold this bird that appears to react positively to the captivity status.